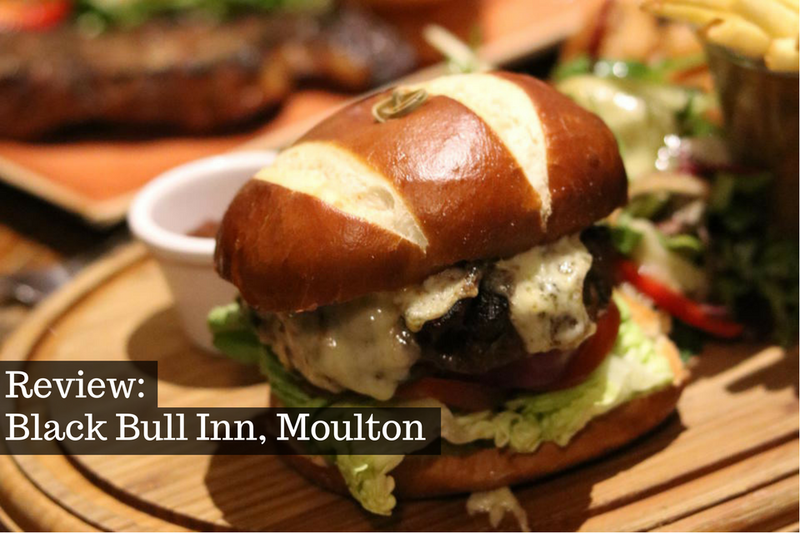 Delivering exceptional service and a menu bursting at the seams with big flavours, it is hard not to forget a visit to the brilliant Black Bull Inn at Moulton. 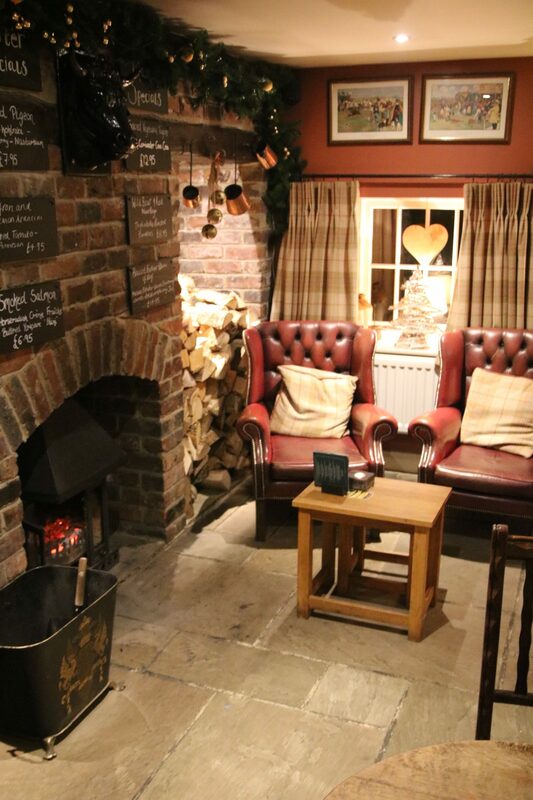 Nestled into a tiny part of North Yorkshire, we headed to the Black Bull Inn to take delight in its Yorkshire offerings of fine food and drink. Having being comfortably seated, we would tonight be tasting 3 courses from their impressive al la carte menu. With a tasty amuse bouche of leek, potato and watercress soup making our way to the table to kick things off, our choice of food this evening was made all the more difficult given the chefs selection and attention to detail with this little mouthful delight which we were now tasting; everything on the menu looked fantastic. 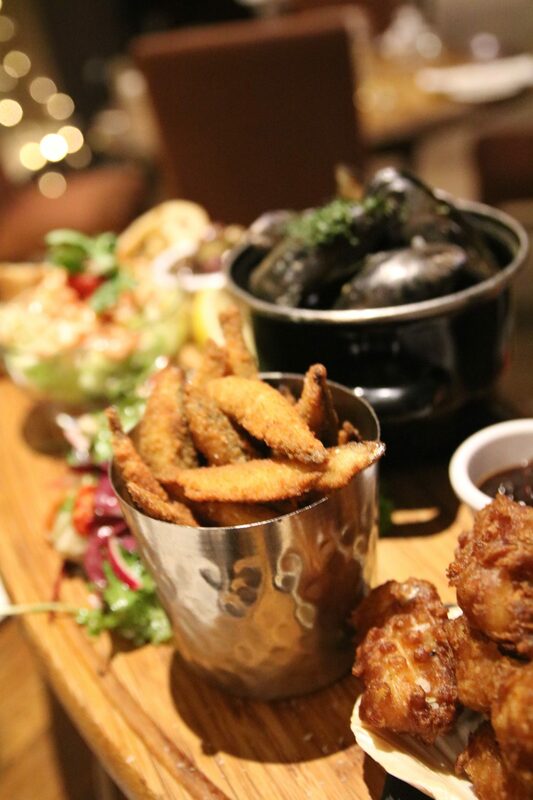 After some tough deliberation, we decided the seafood tapas to share would make a great start to the evening. It was an excellent choice with a platter arriving at our table loaded with crisp whitebait, spicy tempura of king prawns and haddock, fresh mussels and a delicious sourdough crostini, which we ate with a fabulous serving of mackerel pate. It was at this point we both commented on the quality of food as well as the attentive service to which had now become so familiar. The wine pairing for this evening came recommended by our service, the light and fruity 2015 Pinot Noir Reserva could simply not have been paired better with our food. Next up was the main course. We used the options from the grill to guide our choice to the incredible 10oz Yorkshire 30-day sea salt aged ribeye and the equally mouth-watering and stacked high 8oz Yorkshire gourmet burger. 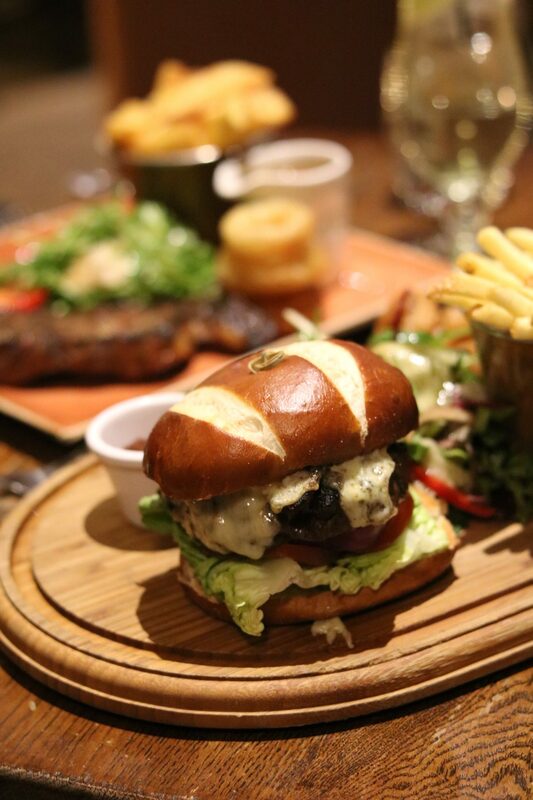 The ribeye was decorated with a serving of a rich peppercorn sauce whilst the burger was accompanied by a red onion chutney, along with each being served chunky chips and a rocket and parmesan salad. 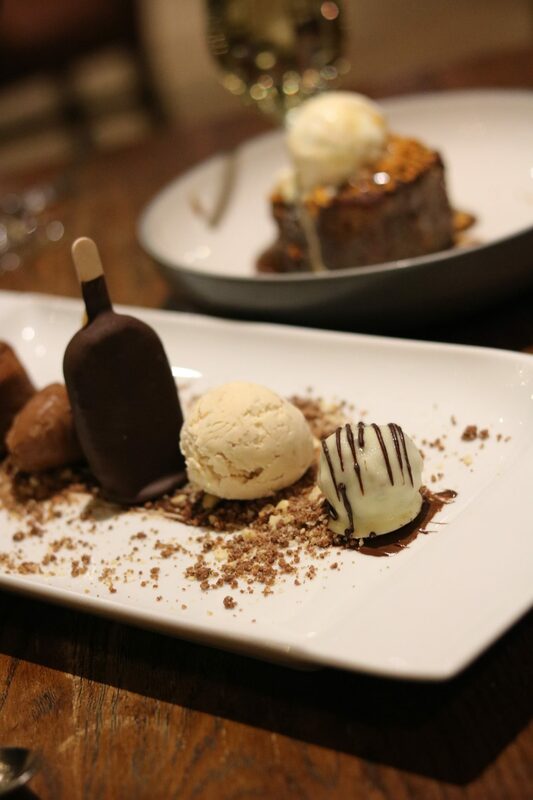 Given that we could not get enough of the menu at the Black Bull Inn, it only seemed fitting and despite our stomachs being full that we ordered a dessert to finish up this excellent evening. 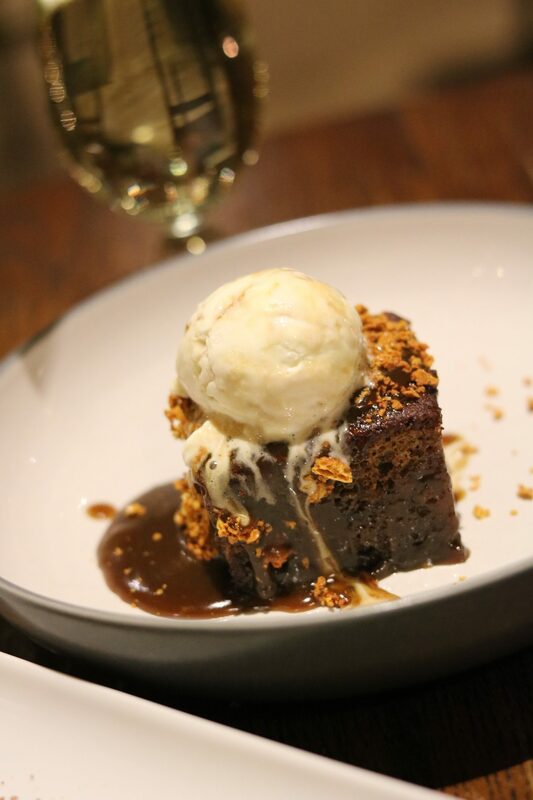 With a selection of puddings from crumbles to meringues, we again took time to deliberate before finally settling upon a sticky toffee pudding served with a smooth butterscotch sauce and deliciously sweet cinder toffee ice cream. We also ordered an indulgence of chocolate and peanut which included a brilliant mini magnum and oozing dark chocolate fondant. 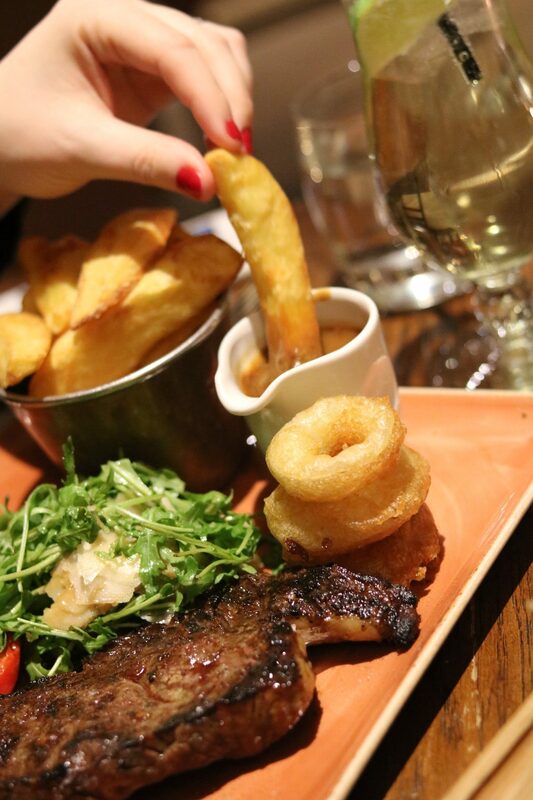 From its high-quality service to the outstanding food, everything at the Black Bull Inn is set to an extremely high standard. With private dining and future plans to expand with guest rooms, this tiny part of North Yorkshire will, without doubt, continue to be visited for a long time come. For the latest news, reviews, offers and competitions – sign up to our newsletter.